These units have been totally renovated and modernized in 2010. The units are totally electric with central heat & air. We also provide pest control, water and garbage pickup. All units are cable ready. Located in South Columbus the complex is duplex homes near south Columbus shopping and close to downtown entertainment and shops. E.J. Knights Apartments is near the Farmers Market, Civic Center and Civil War Navel Museum. There is on site management and maintenance teams for your convenience. 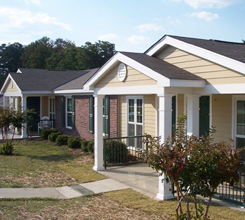 There are 92 one and two bedroom units in our community and some units are handicap accessible. 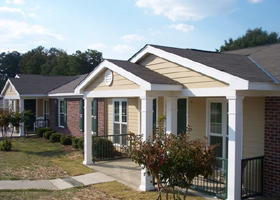 The residents can participate in the ROSS and FSS programs to achieve their life’s goals. These programs have resources to help with and information on education, finances, health and lifestyle. These homes have central heat & air, washer and dryer connections. Also included is water, garbage pickup, pest control and the units are cable ready. The residents have the E.J. Knight Senior Center; which is a nutrition center for the seniors to come greet and meet other seniors – activities includes daily nutritional meals, games, arts, crafts and the occasional field trip and exercise classes. The center is located at 1121 Fort Benning Road. The belief is that a Community is built from homes. Our families are our community!